A good keeper with a great skin color and a very sweet pinky-red flesh. I recognize that watermelon pattern! I suspect that russian watermelon has some Citron melon ancestry! No wonder it is a good keeper. The Soviet Union had a watermelon-citron hybrid breeding project where they recovered many good tasting watermelons that had the long keeping qualities of the citrons! I too am breeding my own watermelon x Colorado Red Seeded Citron hybrids! I don't think there is something about Citron here, but Charleston Gray watermelon was one of cross lines to improve desease tolerance. They have been growing watermelons for ages in Astrakhan and Volgograd areas of the Russian South. From XII century they have been growing great watermelons keeping seeds from the best big size (20-25 kg) watermelons sending their harvest to the central part of Russia by ships via great river Volga! 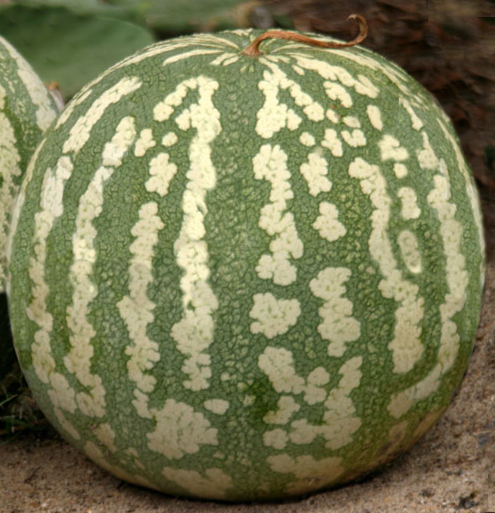 Since 1930 there is an old special melon breeding station near Volgograd called Bykovskaya there this variety Kholodok was born in 1990 from a cross of 3 watermelon varieties (Melitopolskiy 143 x Kuzylbay x Charlestone Grey). Its breeder name Klavdiya Sincha is famous over the world. She is a mother of 40 great watermelon varieties during her 60 years of watermelon breeding since 1944. 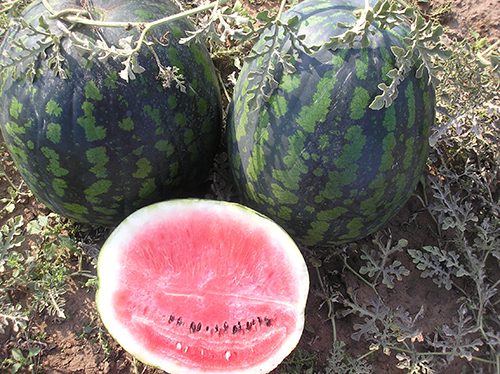 Kholodok has a typical oval shape for mid late Russian watermelons and you can keep it till New Year party (3-5 months). Usual weight is 7-30 kg, no overripe and the taste is improving after 1 month of storage. Last edited by Andrey_BY; January 14, 2018 at 02:40 AM. I am impressed with the diversity. They are beautiful. I don't think there is something about Citron here, but Charleston Grey watermelon was one of cross lines to improve disease tolerance. I could be wrong, but I'm telling you THAT melon has citron ancestry and that is why it has that distinctive pattern on it's rind. I know that pattern after growing citron melons here along with many other watermelon varieties. None of the other watermelons i have ever seen have had that pattern. Charleston grey does not have that rind pattern. It is also why your Kholodok watermelon can store 3-5 months! which is awesome!! I want to find seeds for Kholodok now! Do you know where i can get some seed?! Yes, the Watermelon-citron hybrids were done at Bykov Melon Production Experiment station around 1960. The paper i read was written by M. K. Gol'dgauzen. EDIT: p.s. yes, your comment about the taste improving over the longer time it is stored is consistent with watermelon-citron hybrids. I am positive that this watermelon variety you mention was the descendant of some of that old USSR research in 1960 and i'm positive they would not have given up on that or those breeding lines. now i am even more excited to grow this variety!! Last edited by Keen101; January 13, 2018 at 06:25 PM. But I don't think you can somehow improve Kholodok, because it is perfect))) I don't want to be involved in a project American Kholodok! Just make something different trying hard! Anyway I can send you some Kholodok seeds. Just PM me your address. Bykovskaya (Bykov) Experiment Breeding Station is still the main melon, watermelon and gourd/pumpkin station in Russia. Last edited by Andrey_BY; January 14, 2018 at 03:05 AM. You might like to try New Queen. Nice orange flesh smaller melon that might be earlier than Blacktail Mountain ( I have grown both ). It was about the same size as Blacktail Mountain for me.